Did you ever feel the need for a reliable tool to redirect visitors based on country or IP address in WordPress website? Because you might have specific offerings for specific countries. And a plugin that can help you differentiate your visitors based on country IP will be a great help to you. Isn’t it? Well, the plugin I am going to discuss with you will end your search right here. And you will not have to look any further. 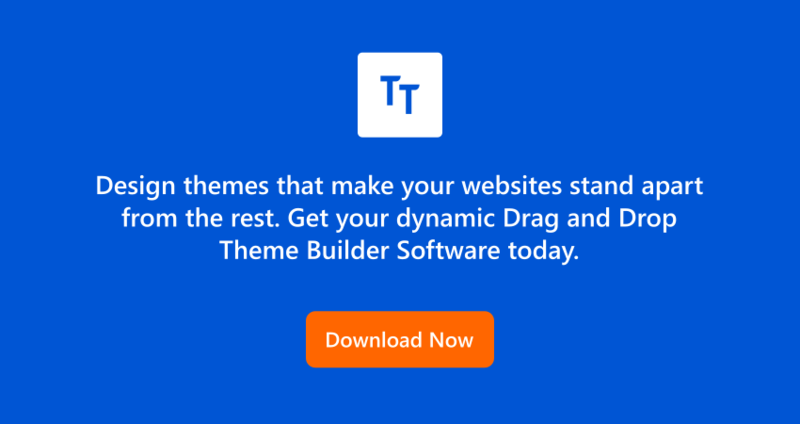 In this article, here at TemplateToaster website builder, I will tell you about a WordPress tool that enables you to redirect your visitors to a predefined URL based on country or IP. The plugin I am talking about is IP2Location Redirection with the average rating of 4.8 out of 5. You can easily employ an extra layer of protection to your WordPress website and restrict harmful access with the help of this plugin. And this is certainly a secure and dependable plugin. 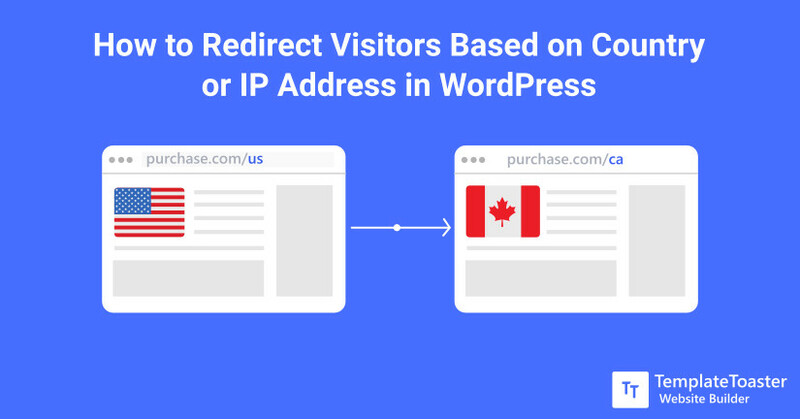 IP2Location Redirect plugin allows you to redirect multiple countries. You can also have multiple redirection protocols applied as needed. IP2Location Redirection plugin provides you the support for 301 and 302 redirection. Also, it has a complete support for IPv4 and IPv6. IP2Location Redirection support both the IP2Location BIN data and web service for geolocation queries. There can be various reasons why you want to redirect your visitors to a predefined URL. Let’s say you run an eCommerce site and you offer different purchase plans for some of your products in the different regions. And it is clear that you would not want people from a particular region could see the pricing of the same product in the different region. 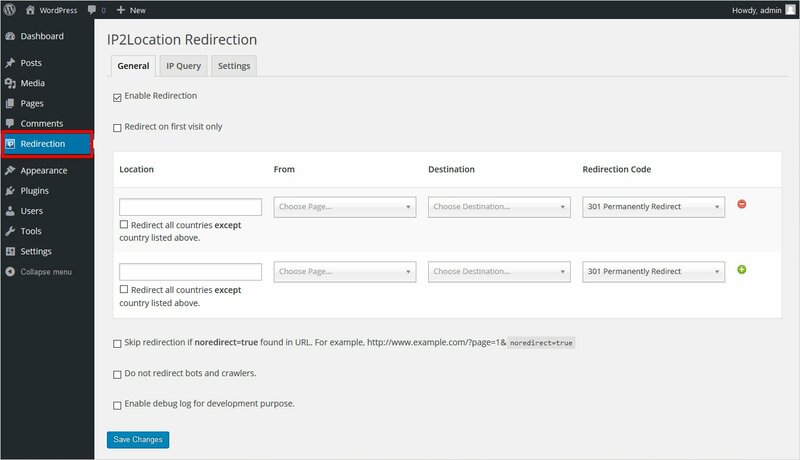 Here comes the usage of this plugin to redirect visitors based on country or IP address in WordPress. This plugin helps you detect the user on the basis of their country or IP address. As we know that an IP address is country oriented and all the users and visitors can be differentiated based on their geolocation and IP address. Therefore, by using this plugin you can hide and show a particular page on your website for a specific region. 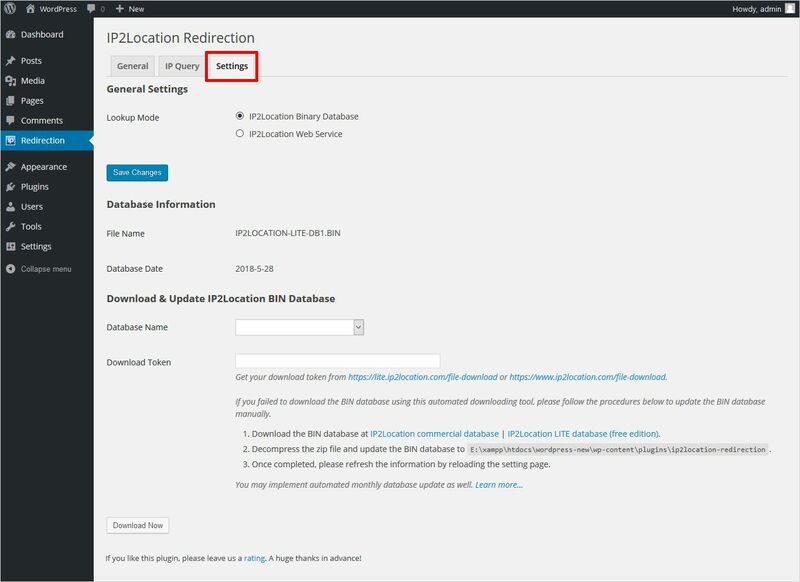 Let’s take a look at the procedure that how you can install this plugin and How to redirect visitors based on country IP address in WordPress dashboard and make the settings as per your needs. 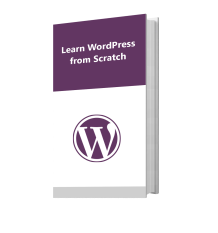 In order to install the plugin, you need to go to the WordPress dashboard plugins first. Now click on the add new under the installed plugins. Now here search the plugin with its name IP2Location Redirection in the search bar at the top right corner in the WordPress dashboard. And once you find the plugin click on the ‘Install Now’ button given there. For a better understanding look at the screenshot below. Here at Templatetoaster WordPress website builder showcases steps to redirect visitors based on country or IP address in WordPress. Once the plugin is installed, now click on the ‘Activate’ button to activate the installed plugin like shown below. Every tab has options to set the parameters for your visitors. Like if I talk about the General tab then there are options to select Location, From (from which page you want to redirect your visitor), Destination (to which page you want your visitor to be directed), and Redirect Code. Here, you have to enlist the countries which you don’t want to redirect. Like here, I have selected the United States, which means I want to redirect all other countries except the United States. So, this way you can add as many countries to the list as you want and restrict them from visiting a particular URL. And the IP Query is for finding the IP address for any country. Simply paste the IP address and click on the lookup button and it will show you to which country it belongs to. Whereas the setting tab has the database information in it. Feel free to test the IP2Location Redirection plugin however you want. And redirecting your visitors on the basis of country or IP and looking for a plugin to achieve the same, then I assure you nothing beats IP2Location Redirection plugin for your WordPress site. Also, to give your WordPress site protection against brute force attack and check out the best WordPress website Builder and web design software to create a professional website refer to this. I hope you like this post and don’t forget to share your words with me.